Many people claim addicted to Facebook. But apparently Facebook could invite danger. Facebook is a social networking service that collects a lot of people in one place on the Internet. 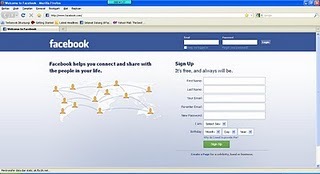 Facebook is similar to Friendster, but recognized as having many advantages. Facebook users from abg to parents aged over 50 years. Facebook acknowledged useful for finding friends scattered. A lot of Facebook users who finally managed to find friends in the past. This adds an added value for Facebook. Besides the photos and tagging was favored by many people. Column comments provided and make the existing notification facebookers to date with the world of facebook’s. Some Facebooker admitted first thing they check when online the internet is opening a Facebook account. Facebook has also successfully entered the ranks as the world’s third most visited site. Even managed to shift senior Facebook social networking world, ie Friendster. Not only used to make friends, Facebook is used for advertising and campaigning. U.S. President Barrack Obama is the first President to utilize up to the campaign via the internet, and many now-presidential candidate who trailed Obama’s actions. But behind its superiority, turns out Facebook has side effects. 1. Waste of time. Facebook users are reluctant apart from computers, laptops, mobile phones, and gadgets that can access Facebook. Much time is wasted in front of the computer. Organize your time. Do not get wasted just in front of the computer. 2. Be careful to install the status on Facebook. There is a tragedy that befell his wife when changing the status of being single. The husband is angry without thinking instantly kill his wife. And this has happened 2 times. 3. Be careful not to put photos on Facebook. Whose name is the internet world, people can do various things. People can edit the photo in such a way that smells of negativity and pass it to the forums or mailing lists. This could damage the names involved. Not to mention photographs can trigger a scene. Put a photo on Facebook wisely, because not only you and your friends would see. Everyone in the world can see it, unless you download your photos into a private setting, so that only certain people can see your photos. 4. Do not put personal information carelessly. Many people do not realize the dangers of putting information on the Internet. By providing employment information, telephone numbers, to home addresses, would be able to invite people for bad intentions. Could have used that information to do no good. So, put your general information. Do not put personal information on your Facebook page. Remember that not only your friend who access Facebook. If you want the information contained safe from strangers, arrange to only your friends can access your Facebook. 5. Disturbed stranger. Many people do not think long when he received the request friend in the world of social networking. Without realizing it, those who accepted to be a friend can access the information contained in the pages of Facebook. Therefore do not hesitate to refuse an invitation to friends from strangers. You are entitled to refuse. Although this may seem trivial, but many cases begin popping up because Facebook. Be wise in using Facebook. Posted on August 7, 2011, in social networking and tagged facebook, facebooking, surf the net. Bookmark the permalink. Leave a comment.